Ten years ago Dr. Mark Gray and I were the first to reveal the ascension symbolism and stargate metaphysics encoded in the Dome of the U.S. Capitol. Last week, we met in New York City while I was in the Big Apple giving a talk at an illustrious foundation. The time was right, once again, for hitting the streets together. 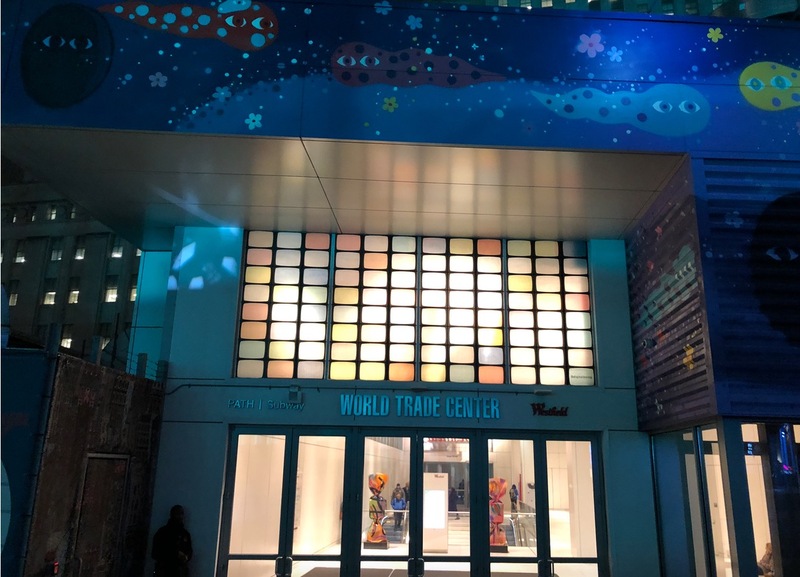 On December 13, 2018 we did a walk about of One World Trade Center and the 9/11 memorial site to explore the structures that replaced the Twin Towers. The theme of oneness was pervasive, if not intrusive. The spirit of resurrection was in the air. By the time we left we got the Buzz : WE ARE ONE WORLD. Here, I will share a few highlights and reflections on the uplifting spectacle at the heart of America. This journey, should you choose to take it, is about rebirth at Ground Zero the emergence of the new world. It takes you inside the volte face moment that signaled the end of the old world and the beginning of the new. After a ‘yuge’ day at the Rubin Museum studying Padmasambhava, ’the master of time’, and Rainbow Light Body guru, I returned to my hotel room for a rest. Mark would be calling soon and I wanted to get steady for what I knew would be an intense evening. Enemy of the State was on Showtime. This was serendipitous as, the night before, I had met the screenplay writer, David Marconi, at my talk in Chelsea. His 1998 thriller — which put the terrifying capabilities of the surveillance state on display —was a major wake up call about the ‘Big Brother’ powers the powers that be possess. The scary thing is the prescient movie is now 20 years old and the new technology for keeping tabs on us is almost beyond our comprehension. Also as out there in the beyond comprehension realm is my sense that the effect of the events of 9/11, the greatest American tragedy, have faded in the memories of many and are not even present in the minds of the next generation. Part of us have forgotten the most important modern global historical event ever happened and the rest don’t even know it happened or how it changed our world! Why were the Twin Towers attacked and destroyed? There reasons are many. For Osama BinLaden, the alleged mastermind of the 9/11 attack, they were a blasphemous symbol of all that was wrong not just with America and Western capitalism, but with his homeland, Saudi Arabia. He hated America’s presence in Saudi Arabia and its invasion of Iraq in 1991. More, he hated the modern world, human rights, and free people. The Twin Towers were America’s (and Saudi Arabia’s) greatest symbol of earthly power, ambition and the dominance of money over God. They had to come down. As detailed in this Slate article by architect Laurie Kerr, the World Trade Center’s architect, Minoru Yamasaki, a second generation Japanese-American, was a favorite designer of the BinLadin family’s patrons—the Saudi royal family—and a leading practitioner of an architectural style that merged modernism with Islamic influences. Osama BinLadin knew his way around construction and architecture. The BinLadin family construction firm re-clad the holy Dome of the Rock in Jerusalem and worked extensively in Mecca. It was known since the 1970s, when Yamasaki designed the World Trade Center, that this site was intended as a mirror image of Mecca, Islam’s holiest site. 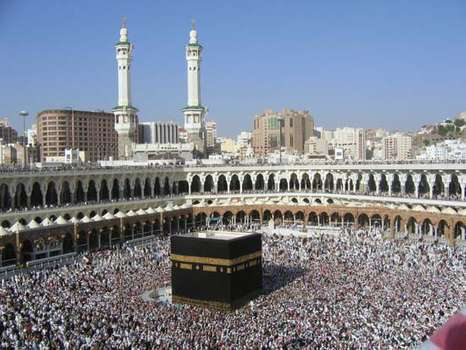 The Kaaba, or The Cube, is a cuboid-shaped stone building at the center of the pilgrimage site in Mecca, Saudi Arabia, and is the most sacred site in Islam. The Grand Mosque, which contains the Kaaba—the sacred black structure toward which Muslims always pray—is now flanked by an enormous Disneyesque complex boasting a Fairmont Hotel and massive clock tower the size of six Big Bens (built by the BinLadin family). The compound houses a mall, a parking garage, and a luxury hotel, with the best rooms—facing the Kaaba, naturally—going for around $5,000 a night. In Islam it is believed the Kaaba is situated directly under a house in the seventh heaven. Angels descended down directly over the site and pave the foundation with stone. The black stone cube of the Kaaba is thought of as a portal to heaven. It was there that Adam was sent after the expulsion from Eden. It is believed the gateway extends from the Kaaba to heaven directly, making it an extreme energy or ascension point. More than just alluding to Mecca in words, Yamasaki replicated the plan of Mecca’s courtyard in concrete by creating a vast delineated square, isolated from the city’s bustle by low colonnaded structures and capped by two enormous, perfectly square towers—minarets, as Islamic architects see them. All of the major design elements of the Twin Towers encode Islamic spiritual influence, symbolism and meaning. Every aspect of them was spirtually meaningful to Islamic symbolists. Even the architects get “out there” with the symbolism, too. In short, the Twin Towers were books in stone that could guide our consciouness into the unified dimensions. As a copy of Mecca, the holiest site in Islam, a zealot like Bin Laden would have viewed the World Trade Center as a false idol. For this reason, among others, the towers had to come down. Whether we acknowledge it or not the terror of the shredding of the Twin Towers, the 9/11 event, is still pulsing in our consciousness. It drives our debt and our economy. The US-led Global War on Terrorism (GWOT) constitutes the cornerstone of US military doctrine. According to Military Times, by 2019 the cost of the War on Terror in Iraq, Afghanistan and Syria launched in answer to the 9/11 attacks will top $6 trillion. The effects of 9/11 pervades our reality as it gave us the USA Patriot Act (2001) and Stellar Wind (2002), both of which put Americans under surveillance ever since. Stellar Wind secretly gave Presidents George W. Bush and Barack Obama the power to expand their power and direct access to our lives. President Trump has continued it. Every phone call, every email, every financial transaction, every Facebook post, every Google search are monitored, recorded and catalogued (and, now, sold by Facebook and other companies). 9/11 opened the gate to a new world and to your world. In effect, we all became enemies of the state on 9/11. America is now a nation under constant surveillance, under new laws, and barely under God. That pretty much goes for the rest of the world, too. At gametime, I met Mark at his East Village apartment. 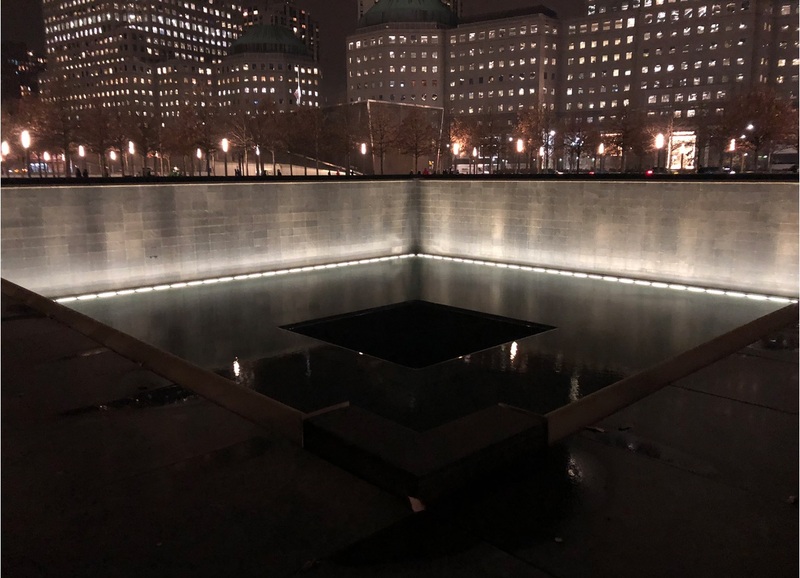 As symbolists and mythologists expert in the ‘stargate symbolism’ of public spaces (or ‘stargate parks’), we had long been interested to see how the Twin Towers would be memorialized. We tried to visit the site during my last visit to NYC in 2015, but it was closed, and the complex was still under construction. In the interim, Mark has devoted considerable time to decoding this rising temple and its new symbolism. My interest in the symbolism of 9/11 stems from my belief that the events of that day not only changed everything, but also fulfilled prophecy. My entire investigative career was reset in 1996 when I came upon Louis Ginzberg’s Legends of the Jews, which tells of the ‘to do’ list of the Messiah. Peace will come to earth, says Jewish prophecy, but certain things must happen first. I will briefly discuss elements of this ‘to do list’ with you as it is the lens through which I observe One World Trade Center and may explain what has transpired here. According to Jewish legend, the Event, the appearance of the Messiah, begins when Michael blows his trumpet and Elijah reappears to introduce the Messiah. Elijah was last seen incarnate as John the Baptist, the Essene initiator of Jesus. To make sure of his identity, the Jews will demand that the Messiah perform the miracle of resurrection before their eyes, reviving dead people they had known personally. 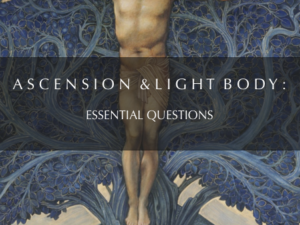 (Actually, the miracle of resurrection is the Light Body transformation. As taught by Padmasambhava, the body dissolves into rainbow colored light, leaving behind only hair, toe and fingernails, which have no nerves to be transmuted, and footprints in stone). But…changing the plan…taking control…or knowing the true job…the Messiah will, instead, or will also, perform seven wonders. One of these wonders is recovering the Ark of the Covenant and its lost components, another is waving the scepter given to him by God, a third is ’grinding the mountains of the holy land to powder’. Then the Jews will believe he is the true Messiah. A vital clue is given by Ginzberg who says the Messiah will have Elijah blow the trumpet which trigggers the appearance of the primal light which shone before the week of Creation. As I have previously written, this happened at CERN in 2012. Next, the dead will rise and swirl around the Messiah from all corners of the world. At the third sound of the trumpet the Shekinah will become visible to all. The mountains will be razed at the fourth sound and the Temple will stand in complete perfection as Ezekiel described it. In essence, this prophecy describes a new world introduced by the Messiah who grinds the mountains of the holy land to powder and replaces them with a temple like the one Ezekiel described. What is Ezekiel’s temple? It is a perfect cube-shaped temple that descends from the sky. 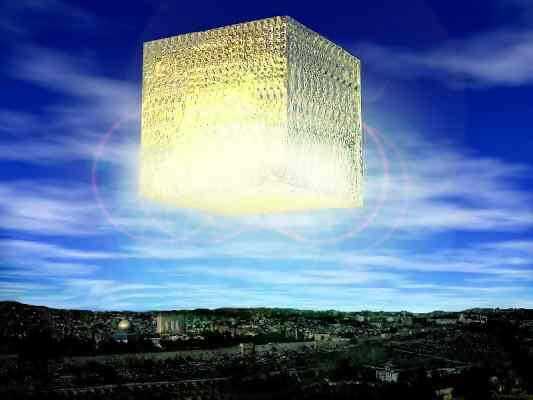 The only other cube in the Bible was the holy of holies, a perfect cube, the place where God’s presence dwelt on earth. Remember this. Back in the late 1990s, I thought this ‘grinding of the mountains of the holy land to powder’ business might have something to do with the production of white powder gold, the alchemical substance that fed the light bodies of the pharaohs (according to my greatly missed friend, Sir Laurence Gardner), which was produced by grinding alluvial gold to powder. When the burning towers/mountains collapsed it took about 12 seconds for the dust of the towers to fall (incredibly at free-fall speed) to the ground. The resulting enormous clouds looked like something out of a Hollywood movie. The pulverized remains of the tower’s concrete filled the street and covered NYC’s people with a fine powder. It was everywhere in Manhattan. These haunted and toxic dust clouds tell experts a lot about how the Twin Towers came down. The offiical explanation that the tower collapses were gravity-driven events has been challenged from the very beginning by the simple fact that it would have required ten times more energy to bring down the towers than was present in the buildings. So where did this extra energy come from? 12 seconds is all it took for the towers to collapse. It took another few seconds for me to link the powdered remains of these mountains of buildings to the grinding of the mountains of the holy land to powder of Jewish legend. The mountains of the new holy land, America, were ground to powder on September 11, 2001. But why? Why would a Messiah destroy the towers? Is it for the same reason that Jesus overthrew the tables of the money changers at the Temple of Solomon (Matthew 21:12-13)? That is, because the moneychangers turned the Temple into a “den of thieves” through commercial activity. Within a week of this incident Jesus is crucified. 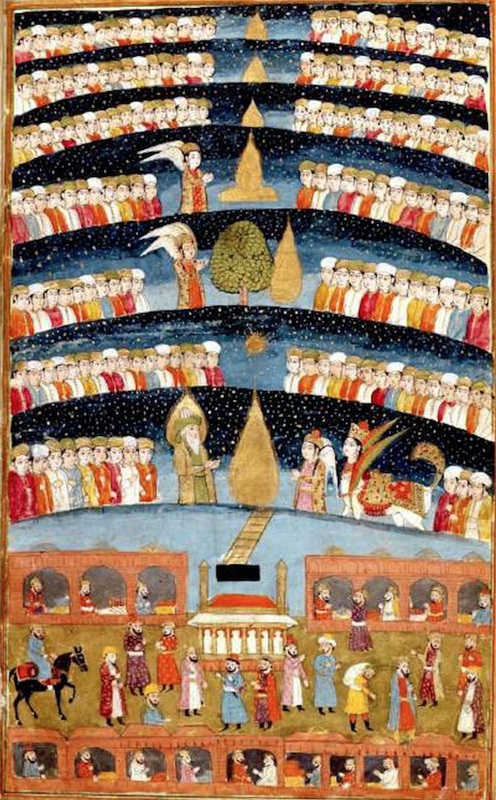 In Islamic tradition, the Kaaba was believed to be built by Abraham and Ishmael, and until Muhammad conquered Mecca and ‘cleansed’ the Kaaba, it housed 360 idols which were worshipped by the Arab tribes. They all prayed to their own god by facing Mecca and their idols. Muhammad destroyed all the idols and re-dedicated Kaaba as a house of Islamic worship only. Did Osama BinLaden view the grinding of the mountains of the holy land as a cleansing? The destruction of the Twin Towers did have a momentary purifying effect. Think of what the world was like in the immediate aftermath of 9/11. No planes were in the suddenly eerily quiet skies. All eyes were on NYC. All hands were on deck. People all over the world simultaneously came together, united in prayer. Yep. United We Stood. One. America was great…for a moment. 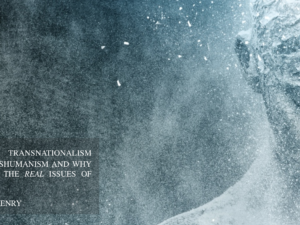 Today, policitally correct thinkers say America is the problem in the world and those who promote the greatness of America are to be treated as terrorists. I am not saying Osama Bin Laden was the anticipated messiah (to my knowledge he didn’t do anything else on the ‘to do’ list), nor can I prove that he was actually responsible for bringing down the towers (there’s lots of theories about how this actually occurred), but if he were the perpetrator of this act of terror, one wonders if he knew the Jewish legend and was therefore further motivated to grind the blasphemous ‘Mecca in Manhattan’ false idols/towers to powder. One thing is certain about 9/11, the powder of the Towers is still free floating in our consciousness. And, the aim of Osama Bin Laden — a global Islamic caliphate, a single world government — is materializing. Civil liberties have been curtailed world wide in the name of “counter-terrorism”. Many governments have cited the urgent need to prevent future attacks as justification for increased surveillance of citizens, curbing of dissent, and enhanced capacity to detain suspects without charge. Was the grinding of the mountains of the holy land the beginning of what is to come? And are signs of what is next encoded in the structures that replaced those destroyed on 9/11? 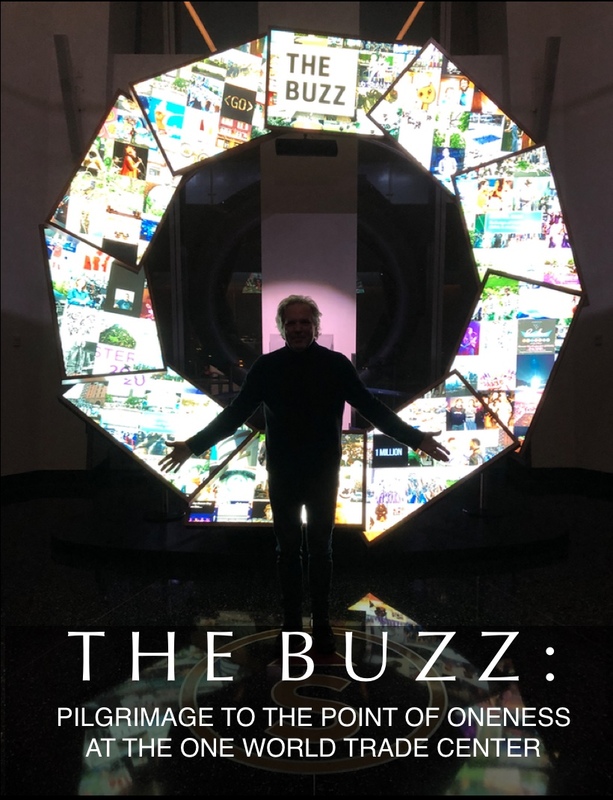 Since Mark and I first collaborated in 2008 my brain has steadily been trained on AI, the rise of God-like companies that didn’t even exist in 2001, and the awakening new level of reality that is growing amidst us. Something, “the voice”, kept telling me that the new site was a ‘stage’ for the newly awakening augmented reality and VR technology. Little did I know how right I was, but that is getting ahead of ourselves. With this thought in mind Mark and I entered the Empire State of mind and set out across the “concrete jungle where dreams are made of” to have a look see at the structures that replaced the World Trade Center. Suddenly, the en-trance to 1 WTC was upon us. Here’s the view entering the complex as we came face to face with One World Trade Center, the main building of the rebuilt World Trade Center. 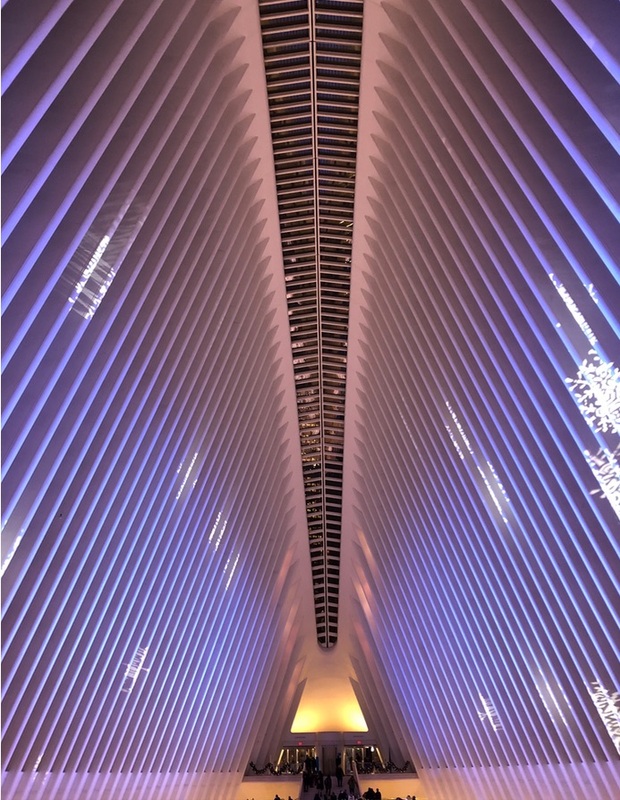 Entrance to the World Trade Center with 1 WTC on right and Oculus on left. We entered the complex from Greenwich Street. (Which green witch? This green witch.) 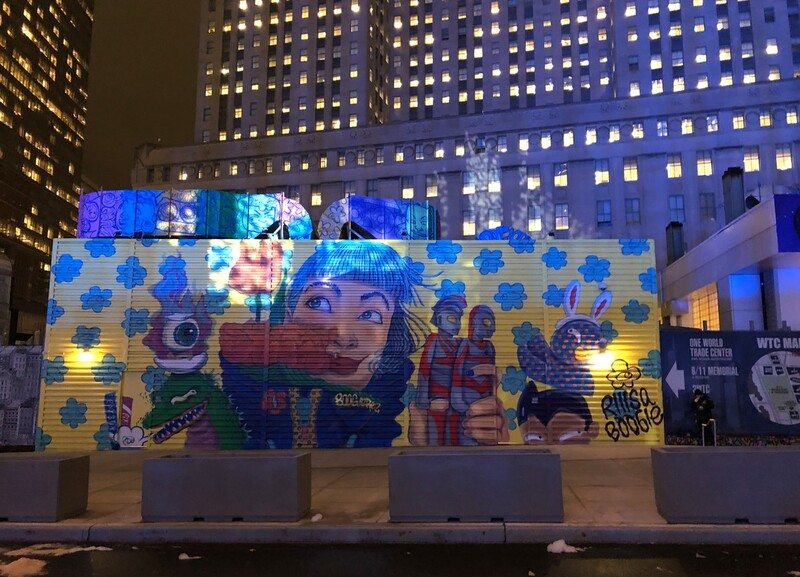 Indeed, it was like we had suddenly entered Oz, as we were greeted not by a green witch on a broom, but by the strange cartoons of a Dorothy-like girl waving at us from the WTC Welcome Building. 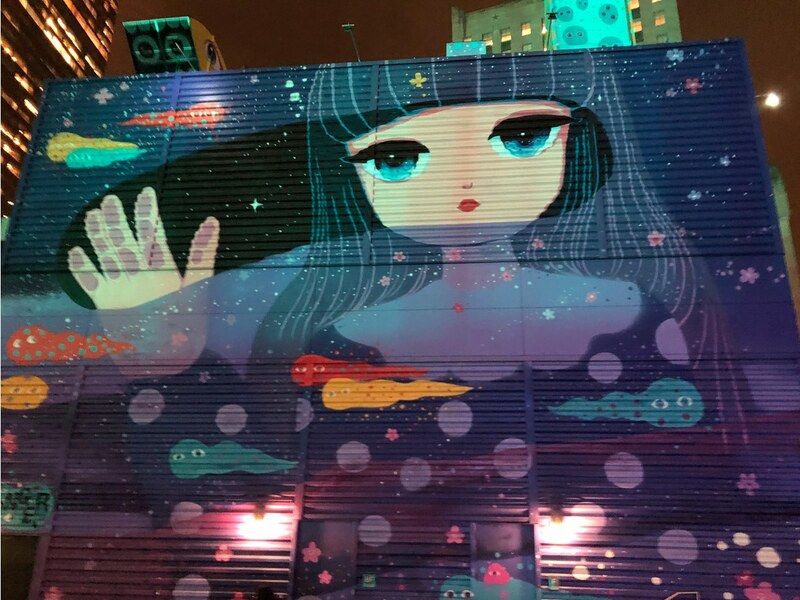 WTC.Com says the artist, Stickymonger, aka Joohe Park, is a Brooklyn-based artist with an obsession to convert spaces into imaginary and fantastical worlds that emerge as giant mural installations. Her world is, indeed, fantastical. A cartoon star child emerges from a portal and waves to us like some being from the future. A star child welcomes visitors to WTC. I dig the cosmic worms…and the reptilians or aliens in the hand of the star child. One WTC is the tallest building in the United States, the tallest building in the Western Hemisphere, and the sixth-tallest in the world. At one time it was called the Freedom Tower. 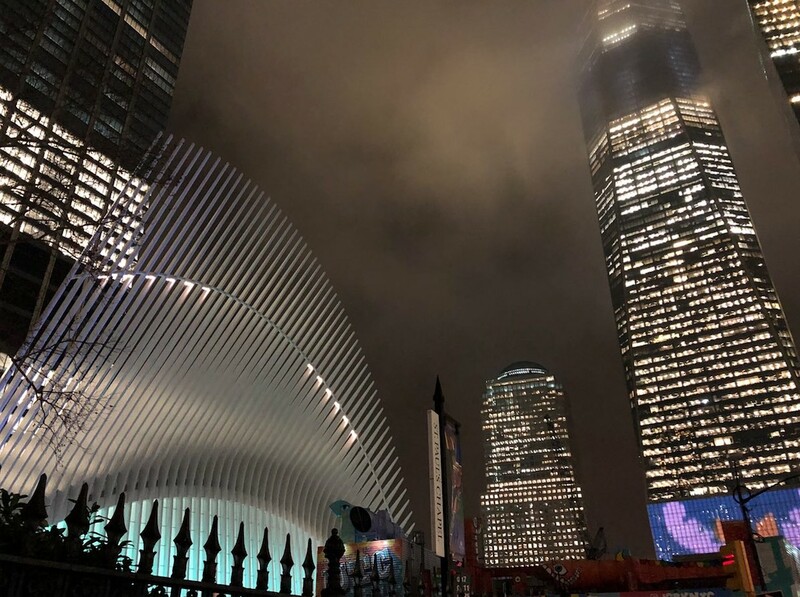 Now it is One World, Trade Center. “It is a tool”, said Mark back at his apartment about this crystal stick. Riffing on the debate about whether 9/11 was “good” or “evil” and if the new world that is arising in its aftermath is either, or, or both, he emphasized that One WTC should be viewed as a symbol, not just a building. We can’t do anything about the past. The perpetrators of 9/11 are/may still be on the loose. But, we can do something about the future and, in Mark’s view, One WTC could be a tool we can use for the future. 1 WTC is a statement of hope and defiance written in steel and glass. Just like the National Mall in Washington D.C., think obelisk, ala the Washington Monument. The cubic base has a footprint identical to the original Twin Towers. The surface of the base is clad in more than 2,000 pieces of shimmering prismatic glass. The tower ascends 69 stories — its edges chamfered back to form 8 isosceles triangles, a perfect octagon at center. It culminates in a square, glass parapet at the crown, its crystalline form creating a vibrant effect, as light refracts like a kaleidoscope, changing throughout the day. The “One World Observatory” is an enclosed observation deck rising 1,250 ft. above street level. The crown of One WTC is a 408-foot spire — consisting of a mast and a communication platform ring. At night, a beacon at the top sends out a horizontal light beam, which can be seen from miles away. Soon, we would make our way to the top of this tool. 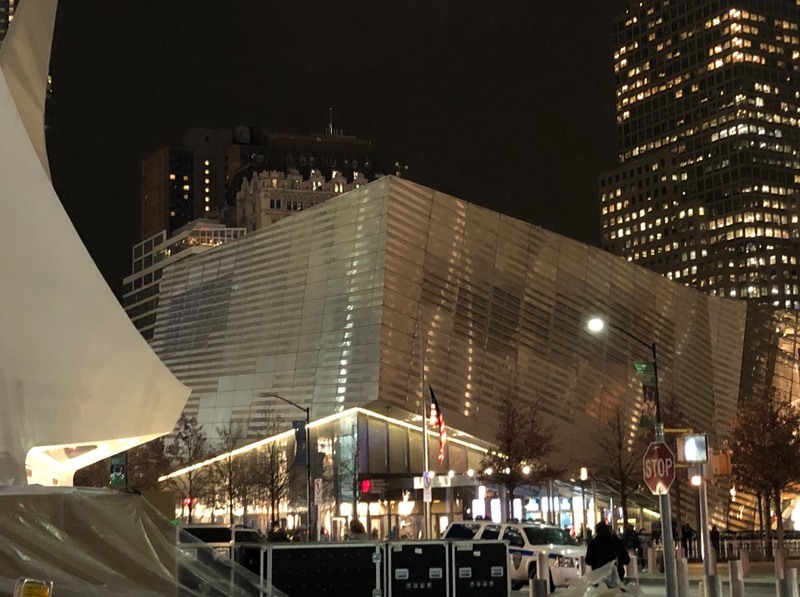 Beside One WTC is the Oculus, a mind-boggling $4 billion glass-and-steel structure designed by Spanish architect Santiago Calatrava to look like a pure white dove taking flight, in honor of the victims of the 9/11 tragedy. The dove is the Christian symbol for the Holy Spirit and is a symbol for peace. Upon entering from the street the view is utterly breathtaking. Its vast open space is exhilirating, welcoming…and decidedly feminine, more like the glowing egg of the dove, rather than the bird itself. It is so futuristic, and beautiful, I couldn’t reach for my camera fast enough. As you come in from the street level, you can just watch the many commuters coming across the concourse as they start their day in the city. The soaring ceiling is right out ouf 2001: A Space Odyssey. The light beam shooting from the top of a golden pyramid is magnificent. 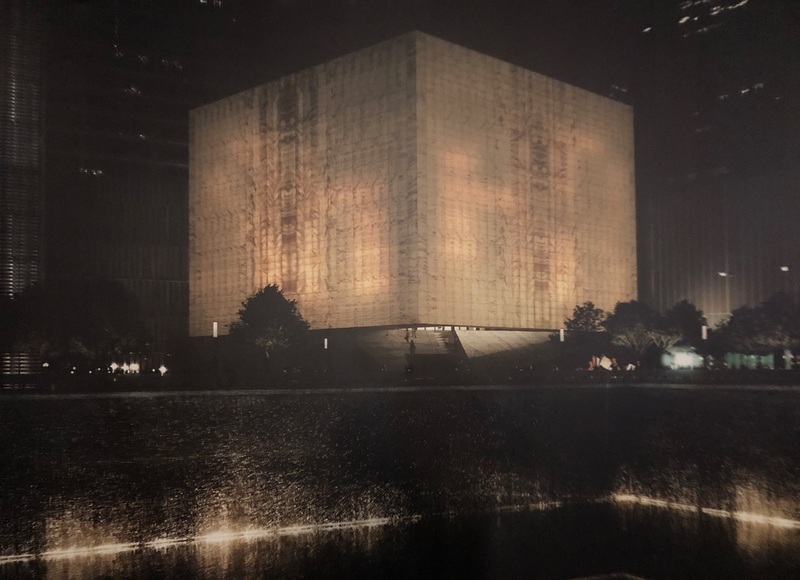 The narrow glass top of the structure opens once a year, on September 11th, and a wedge of light will appear pointing to the 9/11 memorial. The structure is translucent and light floods the space and reflects off the white and grey marble floor, giving the space a clean, pure feel, and inducing a sense of spirituality and transcendence. You now at once this is a special place. If the dove suddenly took flight you would understand this is a space ship. 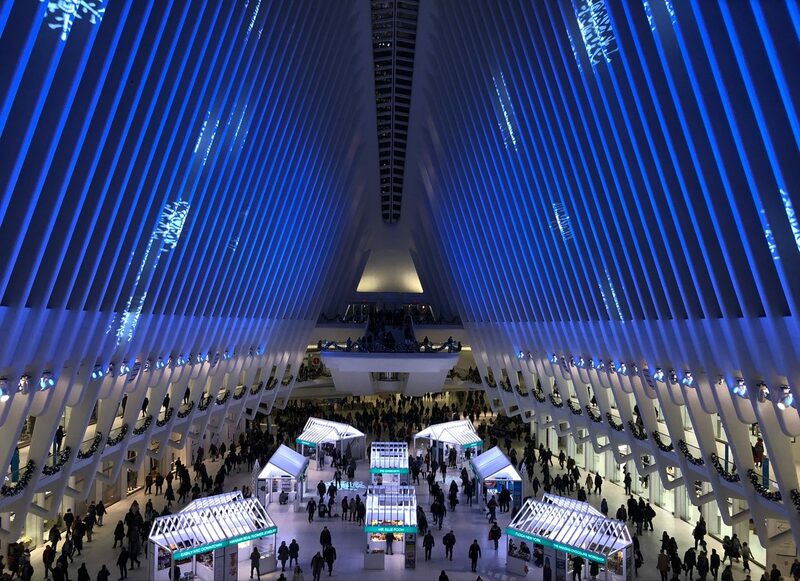 The Oculus is an organic symbol of hope and that life (shopping/trade/commerce) goes on in the aftermath of 9/11. From the ashes of angels has arisen this magnificent sacred temple of…shopping? That’s right. At first, one doesn’t realize that there are stores in this space. You just feel like you are in church. Shoppers will think they are in heaven. I will look forward to a return visit to the Oculus. Next time, I will plan to arrive early morning to catch the light. This is where my augmented reality hunch comes in. Mark and I talked about it over a flank steak sandwich, chips and a beer at one of the Oculus’s too few cafes. If you Google “oculus” you will find that the term is owned by Facebook. As Vanity Fair discussed, in 2015 Mark Zuckerberg made a $2 billion bet on a virtual-reality headset called the Oculus Rift. With it, he thinks he can connect everyone on earth, and make it possible to experience anything, anywhere, through the power of virtual reality. Did someone say make us one? And talk of a new reality? What will be the next huge leap for AI and Transhumanism? What is next for humanity? Virtual reality and “immersive 3-D experiences” — movies, TV, games, lectures, business meetings, family gatherings — in the virtual world. In Facebook’s vision, you will put on the Oculus headset (or have an ocular implant or a band on your head) that, soon, will scan your brain and transmit your thoughts to others like you share photos or thoughts on Facebook. Along the way, you will create a cartoon avatar version of yourself that will “live” in the virtual world. Can you imagine a nearly limitless virtual world populated by billions of cartoon avatars? I know, it sounds bizarre. However, this “metaverse” concept is more than just a scifi dream. Its creation is the goal of the largest companies in the world. Presently, Facebook is the ruler of this universe. Its Facebook Spaces aims to turn you into a cartoon inhabiting its virtual world. 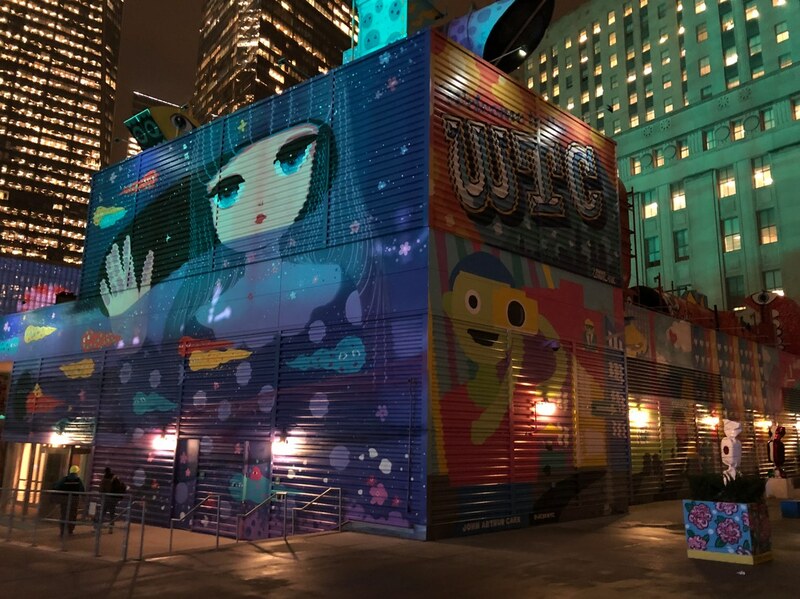 In a few years, your cartoon self will be able to interact with the cartoon star child at the WTC! Like Google’s Magic Leap, Oculus Rift promises to use “augmented reality (AR) creating realistic holograms superimposed on your field of vision — instead of virtual reality — to free your mind. This will enable you to interact with new beings and things that aren’t actually there. They only exist in the new AR reality. As I have previously discussed, he is not the first technologist to do make this remark about the ‘new’ technology. It is very intriguing to me that Oculus NYC and Oculus Rift share more than just a name. They point directly to a future most people are not aware of, but which, bit by bit, is manifesting before us. On the one hand this future is made up of infinite possibilities. On the other it is a future of diminishing civil liberties and human presence. With AI comes ludicrous control, invasiveness and the end of privacy. Who knows? It may be a good thing. 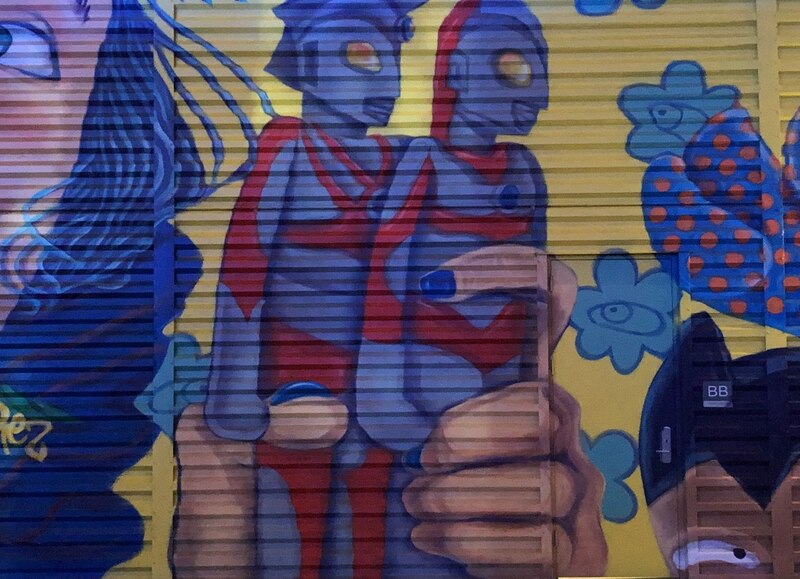 Maybe AI, VR and AR will make us better humans. Maybe one day we will visit the Oculus, put on our Oculus glasses and see a VR Messiah walking in the dove that landed after 9/11. Somehow, I don’t think this will happen. VR has a strange effect on our consciousness. As VR pioneer Jaron Lanier says, “The most amazing moment of virtual reality is when you leave it, not when you’re in it”. After standing in the brilliant white light of the Oculus the outside world, which happened to be dark, had changed…or perhaps I had. I felt really good. Uplifted. Buzzing. Almost as if I was baptized by the light of the dove of the Holy Spirit, I felt charged up and ready to ascend the Freedom Tower. Was it because Mark and I had seen the future? From the Oculus perch we made our way along a wall featuring gorgeous photos of the WTC One. The site is still under construction. The pics tell us what is to come when the wall comes down. Our attention was drawn to the cube-shaped base of the builiding. This bore an uncanny resemblence to the golden New Jerusalem, the cube-shaped temple descending from the sky of Christian prophecy. The New Jerusalem is a celestial city that is inhabited by just humans, made perfect. The north and south pools were just ahead. Surrounded by a grove of 400 oak trees, the Memorial’s twin reflecting pools are each nearly an acre in size and feature the largest manmade waterfalls in North America. The pools sit within the footprints where the Twin Towers once stood. Architect Michael Arad and landscape architect Peter Walker created this stunning experience. Called “Reflecting Absence”, it hynotizes the mind and overwhelms the senses. Water flows from the walls, cleansing the black cubes at the center of each pool, and disappears into infinity. There is a powerful spiritual message encoded in these footprints. Like the Buddhas who attain the resurrection body, and who in their departure from earth leave only their footprints in stone, all that is left of the Twin Towers is their footprints in the stone of Reflecting Absence. More than 12 million people have visited since the memorial plaza opened in September 2011. Each of them has been called to this site. In the coming years millions more will visit these waters, putting prayers of healing in and drawing them out, as well. Mark’s aim is to help them read the signs before them. The site of 9/11 is America’s newest sacred space. Like Gettysburg, Antietum, and other battlefields where masses of Americans gave their blood for freedom, this dot of real estate in lower Manhattan is hallowed ground, especially the two pools where the Twin Towers once stood and their remains in the 9/11 Memorial Museum. (Interestingly, in the week following 9/11 blood donations increased dramatically). As Mark described it, our descent into the Memorial Museum is a descent into an emotional underworld. The actual portal to this pit – designed by the Norwegian firm Snøhetta – stands as an angular wedge, thrust into the north-east corner of the plaza. I found the Memorial Museum to be tasteful, respectful and clearly intended as an initiation into the events of 9/11. Recognizing that I was in the hands of the high priests of 9/11 symbolism, I kept my eyes wide open and my heart gently tucked away from all the strings pulling on it. The ‘Wailing Wall’ and the lone column. The largest of the spaces within the Museum is the cavernous subterranean Foundation Hall, a room with ceilings ranging from 40 to 60 feet. There, you can find the slurry wall―a 64-foot tall retaining wall originally built to hold back the Hudson River―and the remnants of cutoff box columns that once formed the exterior structure of the Twin Towers. Because the Twin Towers symbolically match Jachim and Boaz, the twin towers in front of Solomon’s Temple, Mark calls the slurry wall “America’s Wailing Wall”. The journey into the pit of 9/11 is an aguishing one. 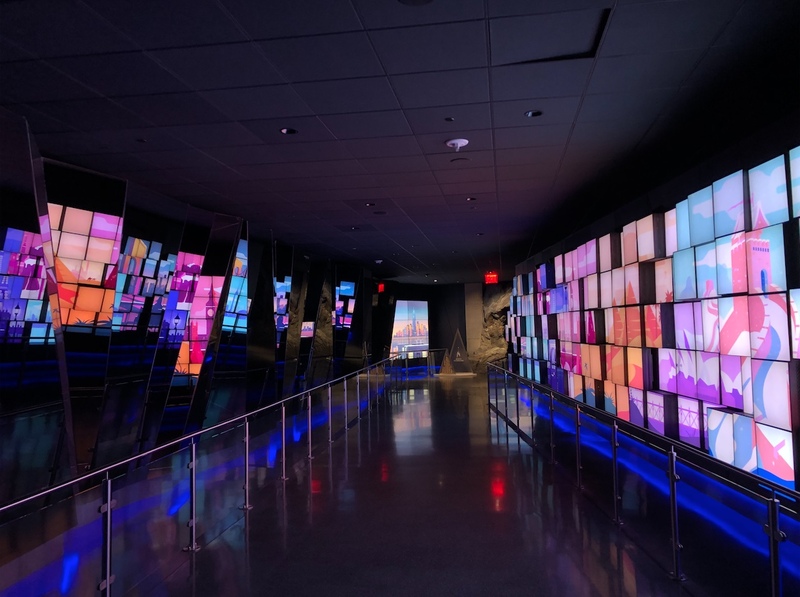 Visitor’s faces gleam wtih tears or are frozen with dibelief, grief and anger as they walk amidst over 10,000 carefully arranged objects recovered from the debris of the Twin Towers. The items are silent but their impact is deafening. Side chapels offer opportunities to relive the events of 9/11. 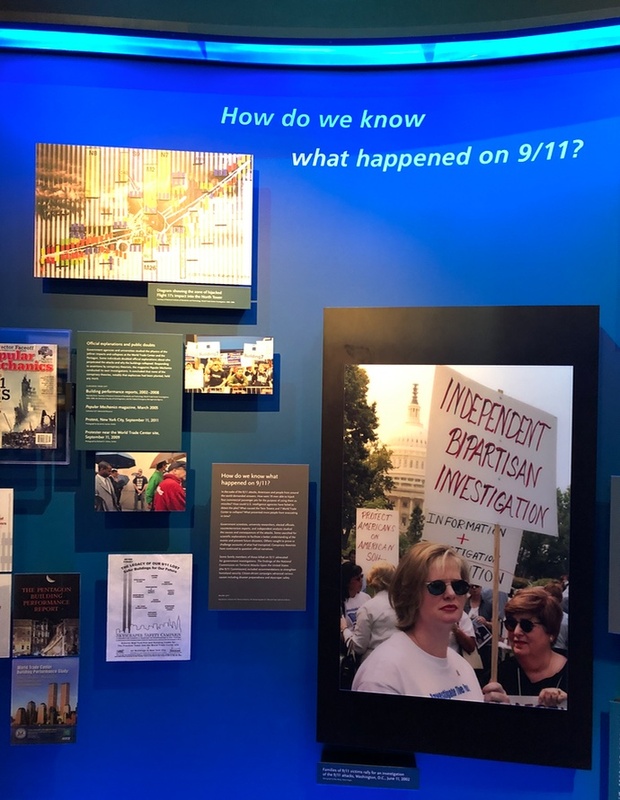 Throughout the walk news reports lead the pilgrim through the progression of horrors of 9/11 until, like walking the Stations of the Cross, one is confronted with the unthinkable. As with the Crucifixion, the theme of rising or ascension is introduced early and referenced often at the Memorial Museum. A strange video at the end of the journey tells of the rise of the terrorist group Al-Qaeda and Islamic terrorism. It is quite bizarre, as it almost sounds like it is a testament to the destiny and cleverness of they who brought down the towers. It is the only thing I would change about the Memorial experience. As you ascend the escalators on your way out one is grateful for the return to the light of our changed world, as imperfect as it is. Yes, the future is here. Is it what we imagined? I mean, is all of this really about a future where an authoritarian surveillance state rules? Is this site a shrine to some evil force? Or, is it a neutral tool that we can use to bring the light? Where are we going from here? Mark and I next made our way to the prismatic One World, Trade Center. 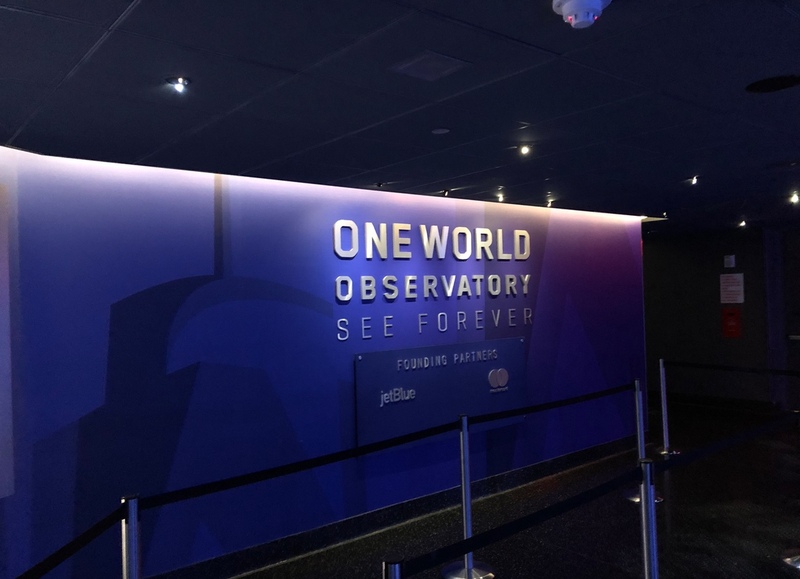 Our destination was the One World Observatory where we could See Forever. 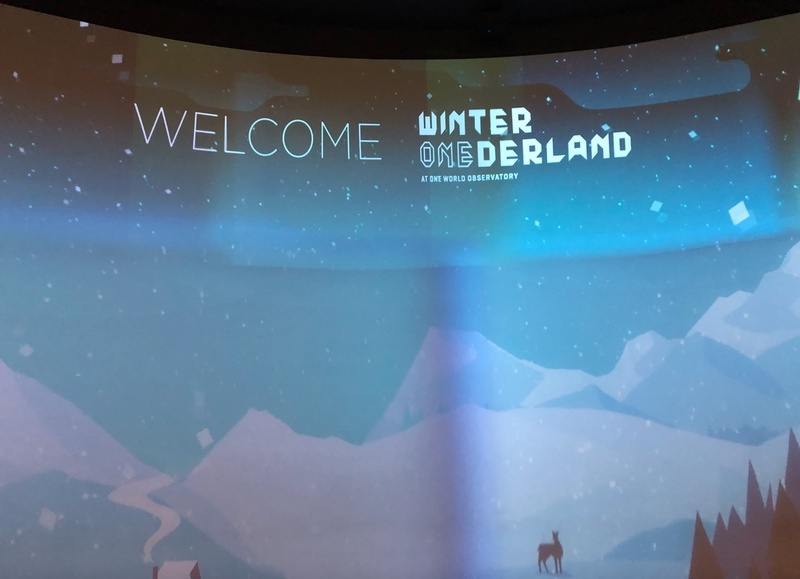 The Winter Onederland festivities were underway. 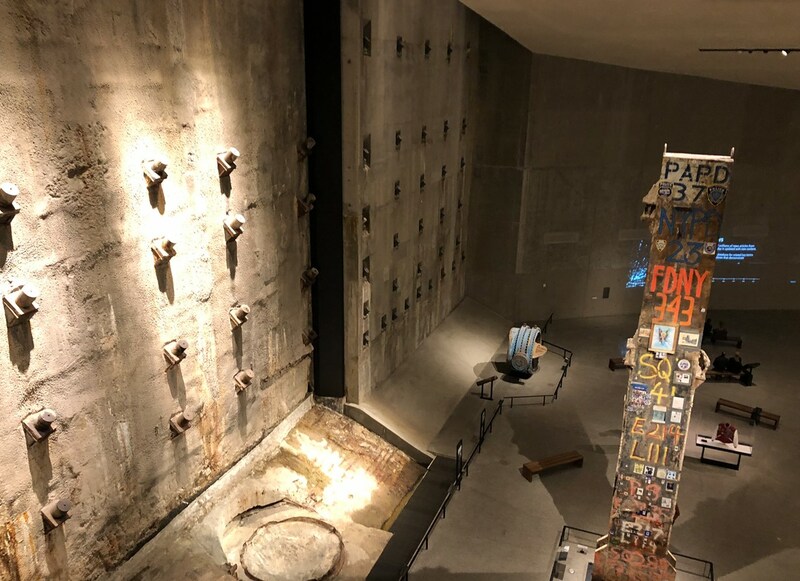 If the 9/11 Memorial Musuem was a journey into the emotional underground the One World Observatory trip is the ascension to heaven. 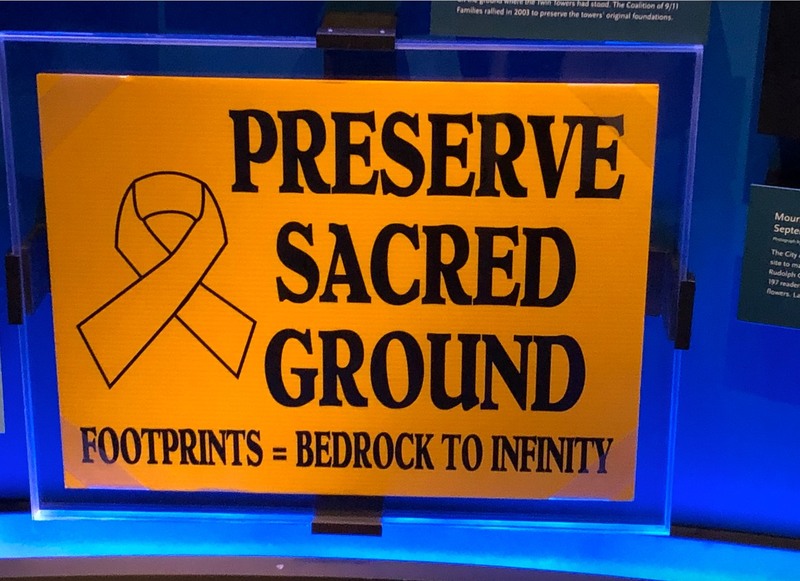 I had my socks knocked when we entered through a cave…it’s supposed to represent the bedrock of the building, but it is just like the entrance to the Great Pyramid of Giza. We ascended 102 floors in a fast 56 seconds. The elevator doors opened to the Observatory. After a short welcome, we were invited to See Forever. This must have been a lucky time for me. The day before I had spent 30 minutes alone in the Metropolitan Museum’s Egypt section. A-l-o-n-e in a city of millions of people. This was followed by another 30 minutes alone in the Met’s Asian section. Unbelievably to Mark, who has visited the One Tower on several very crowded occassions, we are alone in the Observatory. Just us. I don’t want to go into the full experience in detail as I feel that some of the things you see need to be experienced first-hand, and are better if they come as a surprise. However, standing atop this symbol of hope, the top of America at the spiritual successor to the World Trade Center, is truly awe inspiring. One looks out and sees one world. This is the highest point of oneness in the world. I got a buzz from the stargate art on the observation deck. The City Pulse ring is composed of screens that can change interactively at the wave of a hand. The screens tell stories of the goings on in NYC, the Buzz. From the One World Observatory the footprints of the World Trade Center look like glowing black cubes. For me, the view is also a little unnerving. I had Ezekiel in my mind. “In visions of God he brought me to the land of Israel, and set me down on a very high mountain, on which was a structure like a city on the south… . 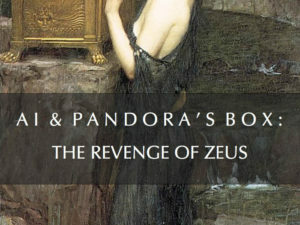 There was a man whose appearance was like bronze, with a linen cord and a measuring reed in his hand. And he was standing in the gateway” (vv. 2–3). Ezekiel has journeyed south from Israel to a city that has a temple. He describes this temple as four square in shape. Some think this city to the south of Israel is Mecca and the four square temple is the Kaaba or Cube. 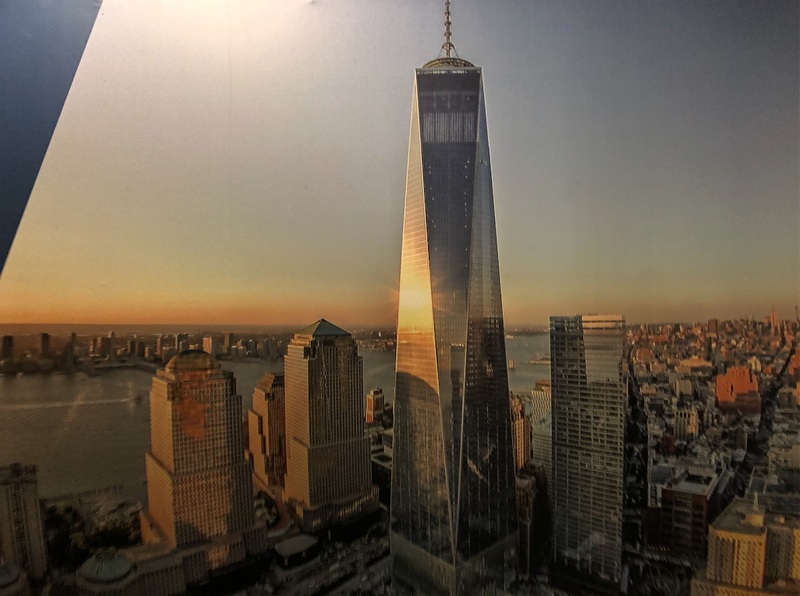 However, given that the original World Trade Center site was designed with Mecca in Mind, and the replacement still has hints of Mecca, one can only wonder if 1 WTC is the new high mountain we are to climb to see the vision of the new temple. As Mark reminded me, in 2008, at the commencement of construction, Pope Benedict visited Ground Zero and prayed before a black cube pool. “God of peace … turn to your way of love those whose hearts and minds are consumed with hatred,” he said, after blessing the site with holy water and lighting a large candle symbolizing sacrifice and resurrection. 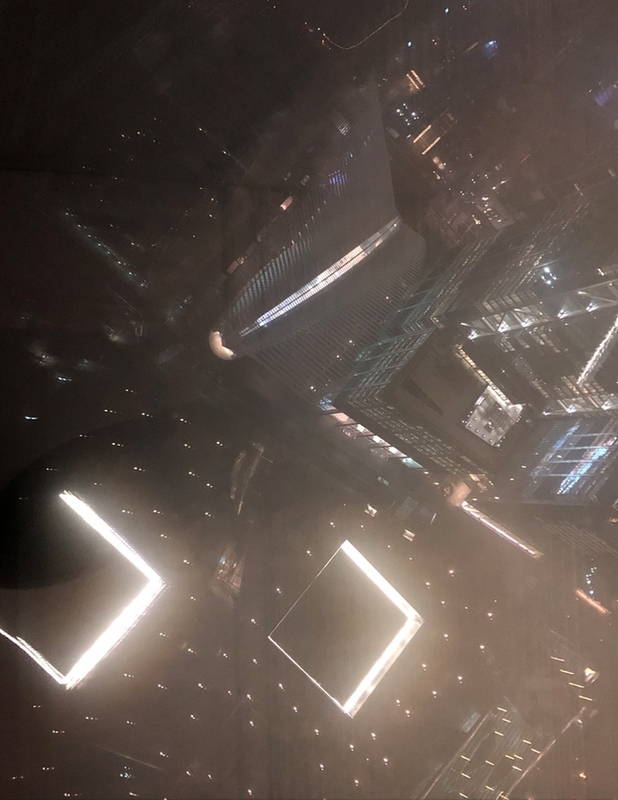 From 102 stories up it became clear to me that, indeed, the Jewish prophecy of the grinding of the mountains of the holy land to powder and their replacement with a cube-shaped temple of Ezekiel had manifested at the World Trade Center. 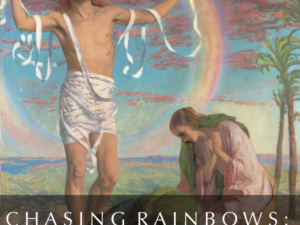 Perhaps this site has more to do with resurrection than we realize. There are many meanings to this story and its symbolism, some visible some not, some dark some light. This is the point of visiting and exploring this site for ourselves. It is possible to expand one’s consciousness and to rise above the known world…and enter the new one. I thank Dr. Mark Gray for all his incredible work and time devoted to decoding this new temple. I hope you enjoy your visit there. Delta Orion via Facebook: I have not read everything here but what I did read was very interesting. For me it is a teacher and reminder of how we are all capable of hate but that we have a choice in how we respond. Are we going to hate back or more forward by inspiring, supporting, sharing and forgiving. As Mother Teresa said…The unadulterated love of one person can nullify the hatred of millions. Unholy marks the spot if we hate. I am sure those who lost their lives here would hope that we come out of this more aware and alive. As I scrolled down your great photo’s, coming to the one of the cube shaped base, the colour of it and the pattern in the centre, immediately resembled to me the image of the Shroud of Turin. Built on Christ? Maybe. A joyful Christmas to you.